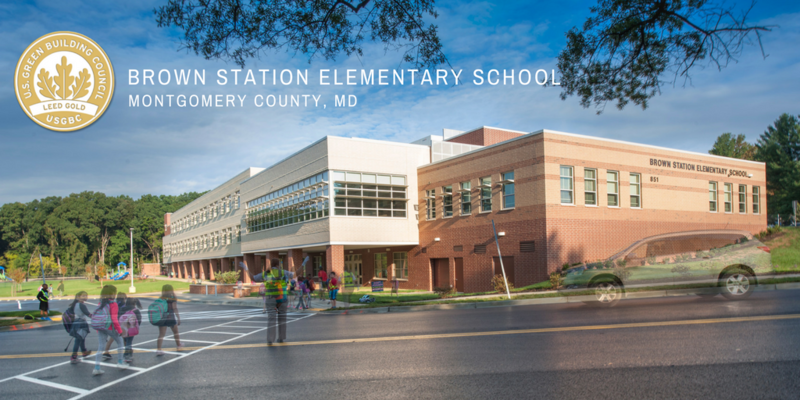 Brown Station Elementary School, located in Montgomery County, Maryland, has received a LEED Gold certification from the U.S. Green Building Council. Sustainable features include lighting control systems with occupancy sensors, an abundant use of windows to provide natural light, and exterior lighting that utilizes energy-saving LED technology. Optimized energy performance is provided through the HVAC system, which uses a ground-coupled geothermal heat pump system. Tapping into the natural geothermal energy beneath Earth’s crust, the system consists of heat pump units for classroom space conditioning and a dedicated outdoor air system with energy recovery that delivers fresh air to students and staff. The HVAC system is controlled by the latest generation of computerized energy management equipment. It includes variable frequency drives for pumps and fans that allow systems to operate at a lower capacity when building loads are reduced. Low-flow water-saving plumbing fixtures are used to reduce overall building water usage. This is RRMM’s fourth LEED Gold school.